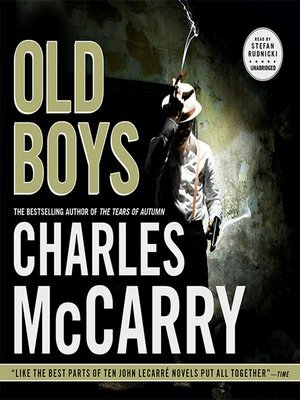 Charles McCarry is considered by many to be the master of world-class spy fiction, garnering praise from peers and critics alike for his riveting novels. Christopher Buckley wrote that McCarry "is not only one of the best writers in America but one of the most important. He dazzles, from epigraph to epilogue," and the Los Angeles Times hailed his work as "first rate, in the tradition of the best espionage fiction, John Buchan to Eric Ambler and John le Carré." In this magnificent novel, Charles McCarry returns to the world of his legendary character Paul Christopher—the savvy intelligence agent as skilled at choosing a fine wine as he is at tradecraft, at once sophisticated and dangerous, and no stranger to the world of dirty tricks. Now Paul Christopher has mysteriously disappeared. Months pass and a memorial service is held for him in Washington. But a group of his retired colleagues—the "Old Boys" from the Outfit—refuse to believe Christopher is dead. Led by Christopher's cousin Horace, the Old Boys embark on a thrilling worldwide search for the master spy and an ancient scroll that may reveal an unspeakably dangerous truth.